Peerless-AV has launched the newest level of its Certified Installer Training Program—the Diamond Level. The level, entitled, “Video Wall Mounting Systems for Direct View LED Displays,” is led by long-time industry experts who have the sales application and engineering experience to make every job successful for those who attend, according to Peerless-AV. 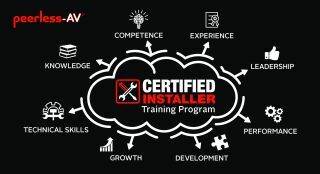 Peerless-AV’s now five-level Certified Installer Training Program is designed to give system integrators and installers an edge on the competition by providing them with both industry education and Peerless-AV-specific training; the trainings are compliant with continuing education standards and are certified by both AVIXA and CEDIA.